For the past three years, Chez Pim has hosted the Menu for Hope event where food bloggers from all over the world donate raffle prizes to raise funds for the United Nations World Food Programme. Last year, the event raised over $17,000.00!!! This is a great chance as food bloggers and food blog readers who spend most of the year writing/reading about food to give something back to people throughout the world who do not have enough food to eat. This year, Chez Pim has asked several fine food bloggers to help host the event and divided the bounty available up into regions. Since I'm an East Coast US blogger, Adam of The Amateur Gourmet is the host. BUT before you can win a raffle gift, first and most importantly, you have to go to the Firstgiving - Menu for Hope page and make a pledge. Every $10.00 you pledge gets you a raffle ticket and an opportunity to win one of the fabulous gifts! If there is a particular item you want, you can specify that item by it's number in the comment section. To see the East Coast Foodie items and numbers go to Adam's page here or here and to see the whole list of goodies available go here at Chez Pim's site. Oh, and yours truly? What did I donate? 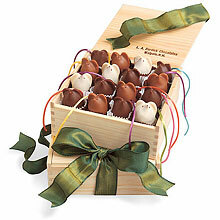 I've donated a box of really sweet chocolate mice from LA Burdick Chocolate, located right here in Harvard Square, Cambridge MA. They are item UE23! They are so adorable you will not want to eat them but trust me, they are even more delicious! Now that is eating wonderful chocolate for a very good cause.